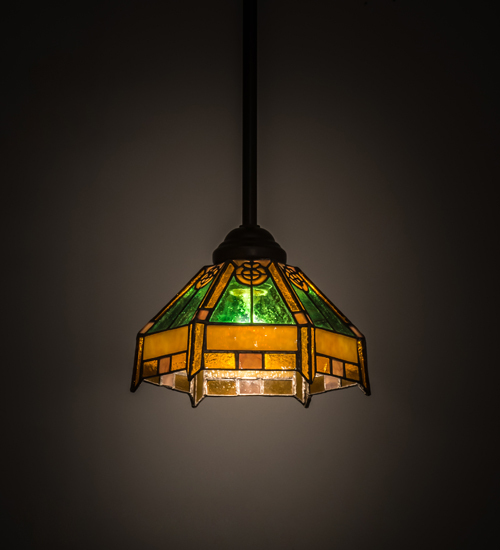 Description: Honey colored accents and medallions adorn this hexagonal shaped shade which is highlighted with Emerald colored glass panels. Sunburst and Honey glass accent the geometric styled border. The shade was constructed using Meyda Tiffany's famous copperfoil construction process and complemented with hardware finished in a warm Mahogany Bronze. Custom colors, sizes and styles are available, as well as dimmable energy efficient lamping options. This mini pendant is UL and cUL listed for damp and dry locations.